Welcome to the sixth installment of Interviews with Latin American Acousticians. You can find the previous interviews at https://acousticstoday.org/interviews-south-american-acousticians/. In this installment, we will talk with Professor Gustavo Basso from La Plata, Argentina. 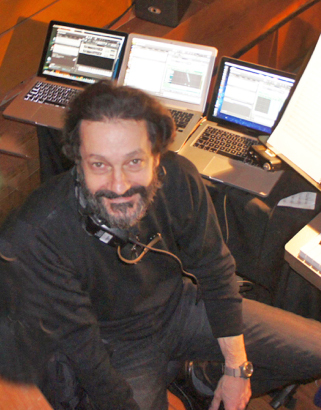 Professor Basso has being involved in acoustical projects at the most important music venues in Argentina including the Teatro Colón, found to be one of the best rooms in its kinds in the extensive research of Leo Beranek (doi.org/10.1121/1.428309). Basso is a musician and an engineer. Currently he is a professor at the National University of La Plata in Argentina. Citations of some of his publications are at the end of this interview. Ernesto: Hello Professor Gustavo Basso, it is a great pleasure to interview you. Welcome to the section Interviews with Latin American Acousticians of Acoustics Today. Professor Gustavo Basso: Hi Ernesto, nice to talk with you. Ernesto: La Plata is a city that has given many important personalities to Argentina, certainly among these personalities there are very good acousticians, are you originally from La Plata? Professor Gustavo Basso: Yes, I was born and was educated in La Plata and I live there now. And I have no plans to move, at least for the next 50 years. Professor Gustavo Basso: I guess like many of us, since I was a kid, I liked music and science. Thus, acoustics was a natural choice. But that does not mean that the beginning was, in my case, linear or simple. My career alternated between these two worlds for a long time -some years devoted almost exclusively to physics and engineering, others devoted entirely to music. Just after I turned 40, I was able to harmoniously coexist with the two disciplines in my day to day life (I mean harmony in a literary license, of course). Ernesto: Literary licenses are welcome. What was the formal part of your education in acoustics? Ernesto: Tell us about what you are as a musician – what you play and when and how? Professor Gustavo Basso: I am a violinist and formed part, between 1988 and 2015, of the Stable Orchestra of the Teatro Argentino of La Plata, the second theater of my country after the Teatro Colón. There I was able to cover almost the entire classical repertoire of symphonic works and operas and, in addition, I was fortunate to participate in a large number of contemporary music productions. Ernesto: How does being a musician impact your work as an engineer? Professor Gustavo Basso: In my case – and I do not say that it has to be this way for other acousticians – music is an essential and inseparable part of my work as a room designer. I always start from how I want to hear certain works of music and from there comes the acoustic and architectural models to be developed. The design and evaluation criteria are, ultimately, musical. Of course, we use the latest advances in the discipline and we control the results through measurements in standard, for example ISO 3382, but the final evaluation is made by the ear, and here I believe that a good musical training can make a difference. Having been a musician familiar with the lectern, I am very aware of the needs of the instrumental formations, on a stage or in an opera pit, so that the best of the musicians can be extracted. Concepts such as balance and orchestral ensemble, simultaneity of attacks, ammonic definition, and some others are always incorporated in the initial stages of design. Ernesto: You have worked in the acoustics projects of the most important music venues in Argentina. Let’s start with the rehabilitation of the Teatro Colón. Professor Gustavo Basso: Yes, of course. My participation in the enhancement of the Teatro Colón came from the hand of Eng. Rafael Sánchez Quintana. Rafael was working in the team formed by the architect Álvaro Arrese to design the Usina del Arte in the City of Buenos Aires. Rafael invited me to join that team in 2002. Later we presented ourselves as a team to the competition for the work of the Teatro Colón and we were selected. Obviously, what tipped the balance in our favor was the experience of Rafael, one of the most outstanding acousticians of the time. The work for the Teatro Colón was very complicated and lasted two years longer than expected – it was completed in 2010 and not in 2008 as scheduled – but the acoustic part went well. The theater was reopened on May 25, 2010 and the next day the three main newspapers of the country spoke on their front pages about the acoustics, fortunately on good terms. I wonder if something similar happened in other theaters of the world. These were times of great excitement for us and our discipline. Ernesto: Would you tell us a little more about your work at the Teatro Colón with Eng Rafael Sánchez Quintana? Professor Gustavo Basso: The work at the Teatro Colón was something special because the theater is special. There is a clear knowledge, in Argentina and in the rest of the world, about its exceptional acoustic quality. The objective was, therefore, to preserve that quality. And the difficulty was in the lack of knowledge that exists, even today, on the totality of the factors that determine the acoustic quality. Here our proposal was extremely conservative: the slightest doubt about the acoustic effects that a change or an alteration of an element or device would cause the decision of complete preservation without any kind of modification. Among many other proposals, the replacement of the air diffusers of the stalls by more efficient ones and the modification of the slope of the stage were rejected. The critical part was the replacement of the entire textile material of the room by another flame-retardant material. The one that was originally in place could spread flames and put people and the building at risk in case of a disaster. To keep this factor under control, the activities of removal of each acoustically relevant element were scheduled in several phases. The procedure was as follows: the room was measured acoustically based on ISO Standard 3382; the stalls were removed and the room was measured again; the boxes chairs were removed and the room was re-measured and we did the same with carpets, curtains of boxes, etc., until all the textile elements were removed. A sample of each element was measured in a laboratory and replacement materials were selected to maintain the acoustic characteristics of the originals. As the re-assembly of the room was carried out in a reverse sequence to the disarmament, we were able to measure the effect of each of the new materials in the room. The idea was to detect any deviation and correct it at the time, before moving on to the next stage. Luckily it was not necessary to reach so much and in the last measurement, with the complete room, values were obtained coinciding with the first one. Ernesto: You have participated together in other projects too, did you? Professor Gustavo Basso: Yes, with Rafael we designed a few rooms since 2002. To mention a few, I could cite the two from the Usina del Arte in Buenos Aires, the Centro del Conocimiento (Knowledge Center) in Posadas city, the Teatro del Bicentenario (Bicentennial Theater) in the city of San Juan (your city) and, of course, the rooms of the Centro Cultural Kirchner (Kirchner Cultural Center), which includes the Ballena Azul (Blue Whale), an auditorium for symphonic music with 2,000 seats that has occupied a central place in the musical life of Buenos Aires since its inauguration in 2015. We are currently designing other spaces for music and we are also participating in the restoration of the Teatro Argentino (Argentine Theatre) in the city of La Plata (my city). Ernesto: Would you tell us a little on the acoustic project of the Ballena Azul? Professor Gustavo Basso: The Ballena Azul was a project of those that are made, in a country like ours, every hundred years; the previous one had been, in 1908, the Teatro Colón. In 2006 an international architecture competition was called, of which I was acoustic adviser to the jury. The winning team was Bares x3-Schnack-Ferrari-Becker. Rafael Sánchez Quintana, was the specialist in acoustics of that team and he called me to help with the development of the final project. We worked intensively between 2008 and 2015 and the room was inaugurated in May of 2015. Obviously, such a complex work had moments of great tension between the members of the development team, the principal, and the political actors of the moment. But I must say that, fortunately for us, the architects considered that the acoustic quality was one of the priority objectives of the project. The same happened with the construction companies, which paid special attention to the acoustic details of the work. From the technical point of view, the Whale does not follow any of the usual typologies (shoe box, fan, sand, etc.) but, since it had to be “put” in a box of 50 x 50 m, it demanded a special design (it’s like a big egg). Unlike the case of the Teatro Colón, in this project we were able to freely test the new theories and acoustic approaches that we had been maturing since the time of the Usina del Arte. Luckily, things went well and both the musicians and the community are enjoying it. Ernesto: I would ask you about each of the venues, but in order to not extend too much, could you give us a few words about the other rooms? Professor Gustavo Basso: The design of each room constitutes a world in itself, and it would be very difficult to summarize it in a few lines. But there is a fact of great importance that was repeated in all of them: the good relationship with the architects in charge of the projects. In such complex works, teamwork is essential if you want to achieve good results. We have been fortunate to work with very good architects, aware of the value of acoustics throughout the creative process. Ernesto: If you allow me a little license, and I hope the readers too, I would like to ask about the Teatro del Bicentenario in San Juan. Professor Gustavo Basso: The case of the Teatro del Bicenteniario is a little different from the rest because this time Rafael and I participated from the project based on the design that had previously won the international preliminary project competition. Our proposal was to design an opera house that would maintain some of the acoustic characteristics of the Italian horseshoe theaters, following the ideas of the architects Marco Pasinato and Sergio Bianchi Bolzán, in which we would apply some of the learnings from the restoration of the Teatro Colon of Buenos Aires. Once accepted, we worked on the preliminary project, modified some things, and its construction began once the results of the digital simulations were appropriate. The theater was inaugurated in 2016 and seems to work according to the plan. The city of San Juan now has, if we add it to the magnificent Auditorio Juan Victoria, a quantity and quality of spaces for musical and lyrical art that compete, in Argentina, only with the city of Buenos Aires. Ernesto: Currently, what are your responsibilities and your academic interests? Professor Gustavo Basso: Currently I am Professor of Musical Acoustics at the Faculty of Fine Arts of the National University of La Plata. There I lead a research team in acoustics that, in addition to the usual theoretical studies related to musical acoustics and room acoustics, provides advice to the state institutions that request it. For example, we designed about 36 small and medium-sized rooms, distributed throughout Argentina, which function as cultural exhibition stations. In these cases, Dr. María Andrea Farina and Prof. Luis Federico Jaureguiberry, members of the team, participated as coordinators. Ernesto: Do you participate in acoustic societies or groups? Professor Gustavo Basso: Like most acousticians in the country, I am a member of the Argentine Association of Acoustics (AdAA). We periodically organize scientific meetings and congresses with the AdAA. Two that I remember especially were the Week of Sound in La Plata in 2013 -in which several national universities, professional associations and science and technology organizations intervened- and the International Symposium on Musical Acoustics and Room Acoustics in 2016 (ISMRA 2016). In them, in addition to sharing the latest advances in our specialty, I was able to make very good friends that I still keep and frequent. Ernesto: Let me mention that you were also the chair of those two meetings. Talking on international issues, how do you see the international component of acoustics? Professor Gustavo Basso: Fortunately, at present, the globalization of knowledge and the exchange of experiences with our colleagues around the world is very fluid. The publications, the congresses, and the social networks allow us to be up to date with the theories and methods that constantly arise. On the other hand, music is a cultural fact that, as such, depends on the specific factors that define each community. When designing an auditorium, certain local characteristics must be taken into account, such as the genres of music played in that city or the most frequent repertoires. It would be unthinkable, for example, to design a room in Buenos Aires without taking into account the acoustic behavior during a tango recital. In summary, I believe that what we do is apply or adapt acoustic science, increasingly globalized, to situations defined by a specific musical culture. Ernesto: Is there anything else you would like to share with the audience of Acoustics Today? Professor Gustavo Basso: Yes, of course, thank you for reading this interview until the end! And that we should feel very fortunate those of us who dedicate ourselves to acoustics, a fascinating discipline that allows us to cross science so deeply with art. Ernesto: Thank you very much Professor Basso! Basso, G. (2001) Análisis Espectral. La Transformada de Fourier en la Música (Spectral Analysis. The Fourier Transform in Music). Second Edition. ISBN Nº 950-34-0150-X. Editorial de la UNLP, La Plata, Argentina. Basso, G. (2009) Percepción Auditiva (Auditory perception). Second Edition. ISBN Nº 987-558-082-1 Editorial de la Universidad Nacional de Quilmes, Quilmes, Argentina. Basso, G. and Belinche D. (2014) Entrevista a Gustavo Basso. Entre la Ciencia y el Arte. (Interview with Gustavo Basso. Between Science and Art). ISBN 978-950-34-1110-05. Editorial de la UNLP, La Plata, Argentina. Basso, G. (2010) Chapter: Acústica (Acoustics), In El gran libro del Teatro Colón (The big book of the Teatro Colón) Ediciones Clarín, Buenos Aires. ISBN 978-987-07-0851-3. Basso, G. (2017) Acoustical evaluation of the Teatro Colón of Buenos Aires, Proceedings of Meetings on Acoustics. 30, 015014. Acoustical Society of America. https://doi.org/10.1121/2.0000640.